#fronthamarone:: Director of MASI, Raffaele Boscaini together with Per Fronth at the launch party for the Amarone Costasera Classico 2012 wine - Photographed at Bølgen & Moi restaurant, Tjuvholmen in Oslo. A great vintage, the wine holds a formidable 94 points score . The worlds leading producer of Amarone wines, MASI of Veneto, Italy, invited Per Fronth and challenged him to make the gift box for their fantastic vintage of the 2012 Costasera Classico Amarone wine. Per Fronth was invited to the Serego Alighieri estate in Veneto by the Boscaini family to first-hand be inspired by their winemaking process and the way wine fully is a part of their life. Family owned and run, MASI Agricola, has been lifted by the Boscaini family since the late 16th century. They are today the leading producer of the Amarone appellation of making wine. Per Fronths inspiration led to the work titled “ Lucciole ( Firefly ) / Venus Passage. “ which encapsulate the Cosatasera wine inside with its drops of dreams. The Per Fronth AMArone Costasera wine and gift box will be available for the Norwegian market from Vinmonopolet priced at 379 NOK from Nov 1st 2018. 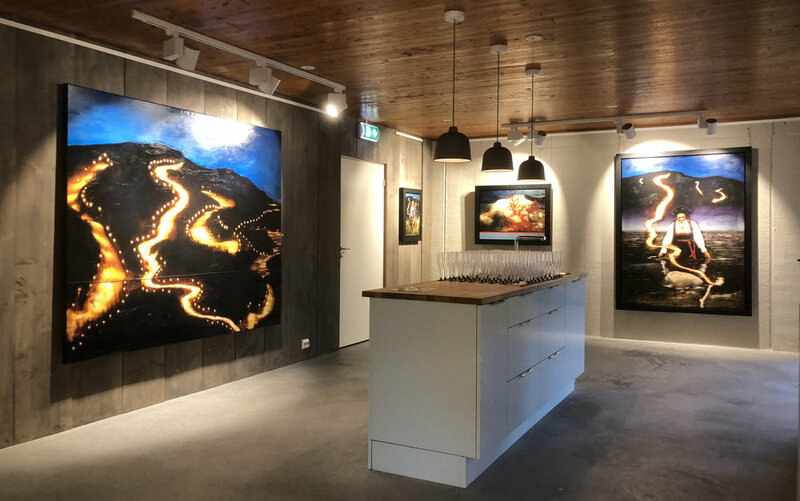 Per Fronth opens new exhibition Setesdal Revisited at Systog Dale in Valle, Setesdal. 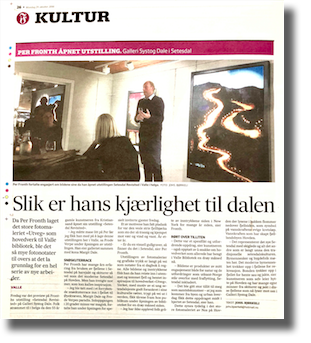 Presenting new works, originals paintings and works on paper, the work finds its inspiration in the valley brought to life by the river Otra, an almost 300 km waterway entering the ocean in Kristiansand. Setesdal is a valley with a rich traditional culture, in music, architecture and folklore with linguistic roots going back to the Viking age.. It is also in modern times a valley which produces renewable energy through massive hydropower. On top of the valley in the high mountains the valley host a contemporary ski resort, Hovden, which every winter grows into a mountain urban centre. Exhibit last till Dec. 9th 2018. Redningsselskapet New HQ aquires large Per Fronth painting. Redningsselskapet, the Norwegian volunteer ocean SAR organisation, commissioned Per Fronth to create major work for their brand new headquarters in Horten. The triptych work “ Buoyancy / Ritual / Sea of Tranquility / Eclipse “ measures 300 x 120 cm , installed in the boardroom it will be part of a great and important art-collection including works of Sverre Bjertnæs and Bjarne Melgaard. - The piece addresses current issues of our times and lives, dramatic events take place in the oceans that binds us together yet divides us by wealth as the last years exodus of refugees have informed us. Young children playing in the water becomes suddenly aware of a foreign object, a lifejacket, drifting past their protected childhood days. Above them the Shadow of the Earth moves across the Sea of Tranquility in an Eclipse. Every moment counts for the living. Redningsselskapet knows this more than any - a thousand helping hands at sea, Per Fronth states. Valle Bibliotek & Kyrkjestove “Sæbyggjen” opens with large Per Fronth commission “ Utveg / Reservoir ( Setesdal). Valle Sparebank commissioned Per Fronth to make the main artwork for new Valle Bibliotek in Setesdal. The contemporary new library which also commemorate the works of famous poet and writer Paal Helge Haugen, original a Valle native, was designed by Svensson architects. The artwork “ Utveg / Reservoir ( Setesdal) depicting a young girl in a traditional Setesdal bunad holding an open book and the same girl in modern clothing focused on her cellphone: The painting address one of rural areas main challenges today: The flux of young woman leaving their villages for higher education in urban areas, only not to return with their new competence because they often do not find relevance in the rural areas the once left. Nationalteatrets Malersal / September 2018: Per Fronth with the finale version for Riksteatrets play, Stein i Lomma, directed by Erik Poppe, his theatrical debut. The play is rewritten from Irish environment to a small community in the North of Norway, turned upside down by a massive film production entering the local lives. Fronth used his imagery from his well-known series “ Archipelago”. Oslo / Norway / Sep 26th 2018: Riksteatret commissions Per Fronth backdrop for play. Filmdirector Erik Poppe turns to theatre and directs: Stones in His Pockets for Riksteatret. work yet, the backdrop for the play rewritten into Norwegian and into Norwegian context. The play has received great acclaim and will be travelling the entire Norwegian country for scheduled performances ending in Kristiansand Nov 23rd 2018. Hamar Sagbladfabrikk will host Per Fronth exhibition 2018 "Architecture of Evolution", a summer exhibition including the very first presentation in a new series of works , Monochromes. In this series Fronth confronts the very essence, or beginning, of his adventure into the universe of his relationship with photography as an art form. The series, focusing on photography´s main component ,the source of light, draws Fronth back to the early days of his encounter with the medium. These first works, landscape renderings from the valley Setesdal are all made in monochrome colours , much like his first photographs made in a makeshift darkroom in the basement of his home at age 14. The exhibition opens on May 26th and runs through Aug 26th 2018. Per Fronth New York gallerist Dillon + Lee exhibits Per Fronth new tapestry Gravity ( Joy) Bubbles / A Man in Full / Trampoline, 212 x 250 cm, at Art Miami 2017. This is the third time Fronth is part of the world largest art fair through his gallerist in New York. Per Fronth new large work Harmony ( Shadow in the Boy) archipelago moves from exhibition to new home SAS Radisson Blu Caledonien Hotel, KRS, Norway. Radisson Blu Caledonien Hotel & Glastad Holding AS acquires large new work of Per Fronth for the complete renovation of the hotel scheduled for reopening in June 2018. The artwork was part of Fronths successful exhibition Inner Rooms at Galleri Fineart / Tjuvholmen / Oslo November 2017. The motif is based on Fronths childhood experiences and the imagery was collected at a popular and beloved seaside beach, Bertes, close to his birthplace. The Radisson Blu Caledonian Hotel is an institution for guests visiting the capital of southern Norway, Kristiansand. Hotel received first guests in 1969. On November 2nd 2017 Per Fronth opened his second solo exhibition Inner Rooms at Galleri Fineart in Oslo since his last successful show Replika in 2014. The new body of works consisted of new tapestry, Interior / Isolation, as well as paintings, lithographs and new silkscreens. Interview with Per Fronth from his new atelier NO 10 about Inner Rooms exhibition at Galleri Fineart / Tjuvholmen. Magazine features large interview with Per Fronth from his new ateliér, NO 10. Fronth explains the process behind the new works in his latest exhibition Inner Rooms at Galleri Fineart / Tjuvholmen. From Per Fronths exhibition Blue Venia at Galleri Kunstverket in Oslo, Norges Bank / Norwegian Central Bank put into their contemporary art collection Fronths latests print Reservoir / Red Birch. The oversize print, a polymer etching print, was made at Atelier Larsen in Helsingborg. Master printer Ole Larsen and his team produced the 200 cm large print in four colors with Per Fronth at a work session in Aug 2015. Reservoir / Red Birch ( Setesdal) is part of Fronths environmental series; his focus on Nature as a pristine and delicate refuge for the modern society. The work makes a deliberate reference to I.C. Dahls famous painting Birk i Storm (1849), Birch in Storm, made during the romantic and nationalistic period in European art history. Fronth reference is but another tree - the diehard mountain birch surviving everything a winter might deliver of challenges. Per Fronth open new graphic works only exhibition Blue Venia at Kunstverket Galleri in Oslo on Thursday Oct 8th. This is Fronthś first exhibition presenting only works on paper in graphic techniques, drypoint, etching, polymer and lithos. Produced in sessions this fall at Atelje Ole Larsen, Helsingborg and in Paris, France, at Idem Paris the works represents a revisit to the exploration of graphic mediums he enjoyed and challenges in New York. Per Fronth started his career as an artist in New York in the early 90s. He studied printing at the now famous PrintMaking Workshopcreated by masterprinter Bob Blackburn, who also received the MacArthur Fellowship. At PMW Fronth met printer Esteban Chaves, a Yale University Alumni who became his first teacher in photoetchings and the possibilites of the print medium. Later Fronth went on to work with printer Nathan Kanofsky of Arak Kanofsky Studios in New Jersey who produced the series Xingu Chronicles , which became Fronthś breaktrough as an artist, presented at Dillon Gallery in New York in 1998, both controversial and hugely successfull. The exhibition Blue Venia follows three separate narratives intutively related to Nature and Human Nature. exhibit REPLIKA at Galleri Fineart / Tjuvholmen.